Heat oil in large skillet over medium-high heat until hot. Add chicken, onion and bell pepper; cook and stir until chicken is browned. Stir in water, tomatoes and tomato sauce. Bring to a boil. Add ravioli; carefully stir until separated and covered with tomato mixture. Cook 12 to 15 minutes or until sauce is of desired consistency and chicken is no longer pink, stirring frequently to prevent sticking. The word “cacciatore,” as you may have guessed, is Italian, and translates to “hunter.” Dishes prepared “hunter-style” in Italy typically start with a type of meat like chicken or rabbit and are then combined with onions, herbs, tomatoes, peppers and sometimes even a splash of wine. Traditionally, cacciatore is served with bread or pasta on the side, but this dish combines chicken cacciatore with another classic Italian dish—ravioli! The result is a hearty, delicious spin on two traditional Italian dinners. Though this recipe ditches the wine, feel free to experiment with your sauce and tip a bit in! Dinner mash-ups are one of our favorite things to experiment with in the kitchen, and ravioli lends itself well to that! 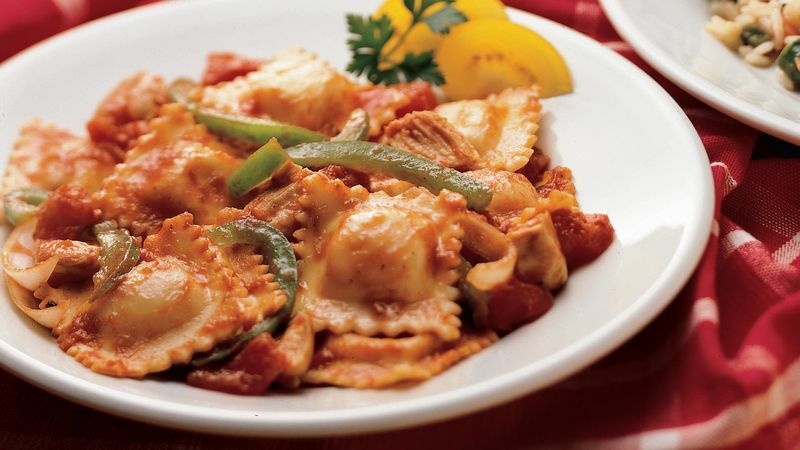 Try this chicken ravioli recipe, ravioli lasagna and more by browsing all of our creative ravioli recipes.